The Stanardsville Independence Day Committee (SIDC) is a group of volunteers who report to the Stanardsville Town Council. The SIDC is annually tasked with the planning, funding, promotion and execution of the town’s annual Red, White, Blue ‘n Greene (RWBnG) community 4th of July celebration. Bring the community together in celebration of our shared, small town, American identity. Showcase Greene County and the Town of Stanardsville as a family-friendly, tourism-friendly place in which to visit and conduct business. Benefit scores of local charities to strengthen the safety network of our community through philanthropy and exposure. The Red, White, Blue n Greene is entirely funded by donations from our community members and business leaders. 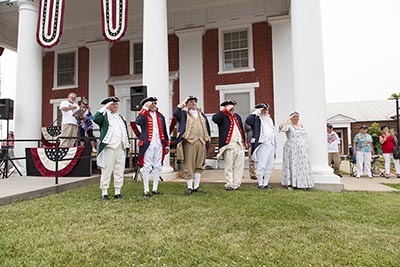 Celebrate Independence Day at the Red, White, Blue ‘n Greene 4th of July Celebration in Stanardsville, VA this year and experience small town America at its finest. Starting with a parade down Main Street at 3 PM and ending with the Capitol Sheds Community Fireworks Display after sunset, this free, family-friendly event is filled with so many sights, sounds, entertainers and attractions that it is almost certain to provide something to delight every member of your family. Friendly people, free parking, and free admission make the Red, White, Blue ‘n Greene the place to be. Mark your calendars today!